In 2007 Ireland supplied 96% of the total energy demand with fossil fuels (7% domestic and 89% imported) and 3% with renewable energy, even though there are enough renewable resources to supply all the energy required. As energy prices increase and the effects of global warming worsen, it is essential that Ireland begins to utilise its renewable resources more effectively. Therefore, this study presents the first step towards a 100% renewable energy-system for Ireland. The energy-system analysis tool used was EnergyPLAN, as it accounts for all sectors of the energy-system that need to be considered when integrating large penetrations of renewable energy: the electricity, heat, and transport sectors. 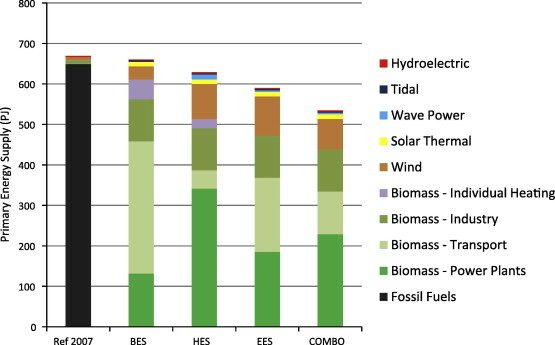 Initially, a reference model of the existing Irish energy-system was constructed, and subsequently three different 100% renewable energy-systems were created with each focusing on a different resource: biomass, hydrogen, and electricity. These energy-systems were compared so that the benefits from each could be used to create an ‘optimum’ scenario called combination. Although the results illustrate a potential 100% renewable energy-system for Ireland, they have been obtained based on numerous assumptions. Therefore, these will need to be improved in the future before a serious roadmap can be defined for Ireland’s renewable energy transition.